If you've worked a lifetime with the intention of retiring in comfort, you probably don't want any surprises on the economic front when you become a senior. There are steps people of any age can take to protect their finances to avoid stress over money issues. 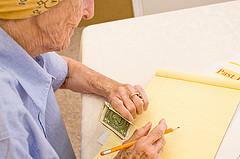 Learn tips for handling economics for seniors and how to avoid scams. Many basic money issues won't change just because you're a senior citizen. Hopefully, you've managed to practice good financial habits over the years and you've built up a comfortable nest egg. You might have invested in the stock market and done very well if the market has been favorable. However, when the market is down, this can greatly affect your bottom line. If you choose to invest in the stock market, it's wise to have a financial advisor on hand to help you make the best decisions. There are even some types of fixed-income investments that may be perfect for your situation. Once you retire, you may have to live on a fixed income. Some seniors will have the benefits of a pension. If you've never lived on a budget, you might be in need of one now. Not only will you need to allocate funds for regular expenses, you should have money set aside for emergency situations that will arise. If you're not yet at retirement age, but you're wondering about applying for Social Security benefits and when you'll be eligible for them. You can check with a financial planner to see what's best for your situation. What if your spouse has always handled financial affairs? Widows sometimes find themselves in this situation because they allowed their husbands to fully control money matters. When their husbands die unexpectedly, these women have a difficult time paying bills or knowing how to manage money. If at all possible, it's best to involve yourself in the financial process somehow so that you're not blindsided by a death that leaves you unprepared to cope. If you're the primary caregiver of a parent, relative or other senior citizen and you're responsible for maintaining his or her finances, you should be aware of the assets and debts. You should figure out a budget for the individual to comfortably live on. It also helps to educate yourself on the particular details of senior citizens and economics, because in many cases, expenses such as Medicare insurance supplements can alter a senior's financial picture. However, for some children of seniors, they may develop concerns if they feel their parents are being taken advantage of monetarily, either by friends or family. In some cases, it may be necessary to enlist the help of a physician or attorney, but laws differ from state-to-state on how much control you can have over someone's finances, especially if he or she is deemed to be fully competent. Unfortunately, many seniors fall victim to scams perpetrated by con artists plotting to swindle them out of their hard-earned money. You might receive phone calls from people claiming to be with your bank or financial institution. The callers ask for personal information such as a Social Security number or bank account number. But, beware! Many companies who deal with such privileged information confirm that they won't call you and ask for it. If you initiate the call, you may be asked to provide details like this, but if you receive such a call and you have any doubts, hang up and phone the company yourself to report the issue. You'll want to enjoy your years during retirement, not constantly worry over money. The earlier you plan for this event, the more prepared you'll be. You can always find information on senior citizens and economics in publications geared toward the mature adult, such as Senior Journal and AARP magazine. Money doesn't have to be a stressful topic; with a little wise planning and budgeting, your golden years can be exactly that.